Thank you for your interest in our 300 Hour Teacher Training Program. This program is for graduates of a 200 hour teacher training program and seekers looking to travel further on their yogic path. Yoga Bhoga is a registered yoga school (RYS) with the Yoga Alliance (the governing body of yoga certification). Our 300 hour program is designed to continue the curriculum of our 200 hour program deepening your practice and refining the tools you have to teach others. Completion of this program is a testament to your dedication to the yogic life and to your students. The 300 hour goes deeper into the yogic philosophy of teacher and student (sadhaka). Through investigation of the yogic lifestyle, this training emphasizes the skill, professionalism, and embodiment of the teacher. Broad exposure to various styles including yin, restorative, and vinyasa will provide a gateway to unveil each students teaching specialty. Refining the translational knowledge of asana (through advanced study of the subtle body in action) students will leave the 300 hour program with the skill to create progressive sequencing for 4 to 8 week series. 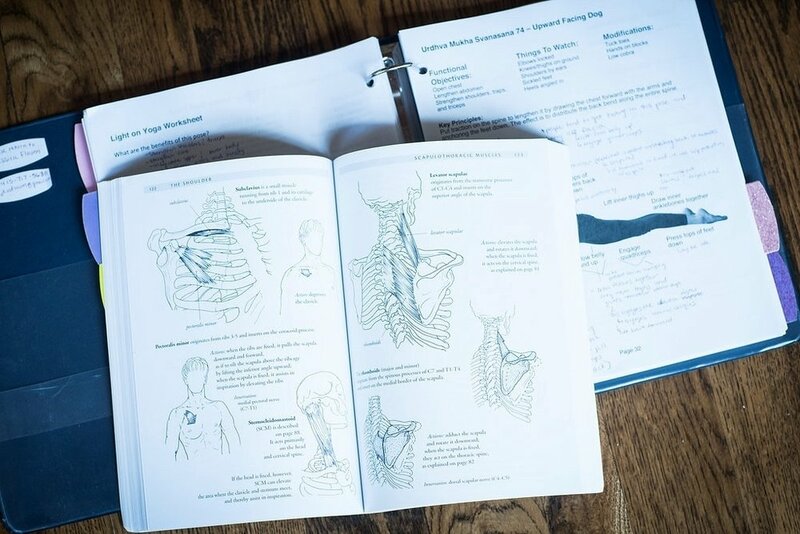 Through deep study of the following topics you will refine your voice expressing your unique point of view in the classroom setting, enabling effective transmission of the yogic traditions. Broadened perspective and versatility of other styles such as yin, restorative, and more! Art and science of teaching the student in front of you (efficacy). One aspect that is often overlooked in trainings is how to effectively teach students. It is one thing to have the knowledge and another to communicate it effectively in a way the meets the unique student in front of you. After completing a 200 hour program, teachers may feel they have just scratched the surface of the vast educational content in yoga. You may feel like a "Jack of all trades but master of none". This program offer students an opportunity to refine, focus, and optimize their teaching experiences. The program will investigate the following subjects in great detail. Meghan Maris, Scott Lennartz, and Krista Loveless are the lead teachers for both the 200 hour and 300 hour programs. See the 200 Hour Teacher Training program for their full biographies. In addition, we have a number of guests joining us to share with you their unique perspective and specialty. You may also receive their guidance more personally as one of your mentors throughout the program. This philosophy and ethics of yoga involves deep examination of the motive behind action rather than the act itself. Discover how to lead a fulfilling ethical life and teaching career with this opportunity for reflection and application. Through self-study, readings, and discussion you will be lead through applying philosophy and ethics to your own life and your life as teacher. Some of the texts we will be using as a platform for discussion include. The following books are required for the course. There is a supplemental reading list we provide during the program. You must have completed a 200 hour teacher training program. You must have a regular yoga practice with proficiency in the following postures: Urdhva Danurasana, Adho Muka Vrksasna (at the wall), and Sirsasana A (at the wall). Issues that arise from injury, structural issues, or a specific medical condition are workable. The intention is to determine your overall ability. If you are interested in applying to our yoga teacher training or wonder if it might be right for you, contact Meghan at meghan@yogabhoga.com. In addition to submitting a written application, you'll be asked to take a class with Meghan and/or Scott and also have a brief meeting to discuss your practice and any questions you may have about the program. It's so important to feel comfortable with the teachers, the curriculum, and to be clear in your motivations and interests for taking the program. We want you to have a meaningful and transformative experience! The cost of tuition is $4200 ($300 discount when paid in full). This includes all instruction, printed materials, unlimited classes at Yoga Bhoga, and the three night retreat at Breitenbush. Payment plans are available. Please note tuition does not include the cost of text books.